The next upcoming Arbor Day is on Friday April 26th, 2019. Arbor Day is observed in Spring but dates vary depending on the region's climate and planting season. It is a holiday to encourage people to plant and care for trees. Arbor Day originated in Nebraska by J. Sterling Morton. Birdsey Northrop of Connecticut globalized it in 1883 on a trip to Japan. 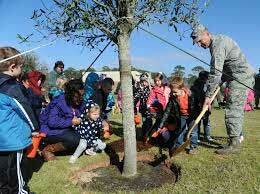 The American Forestry Association assigned Northrop to campaign for Arbor Day nationwide that same year. When is Arbor Day 2019? When is Arbor Day 2020? When is Arbor Day 2021? When is Arbor Day 2022?